Just ahead of the weekend, Microsoft kicked off an 'Ideas Drive'. The request came, more specifically, via Team Xbox aiming to shepherd those with ideas that could improve Windows 10 gaming to an ideas collection portal. 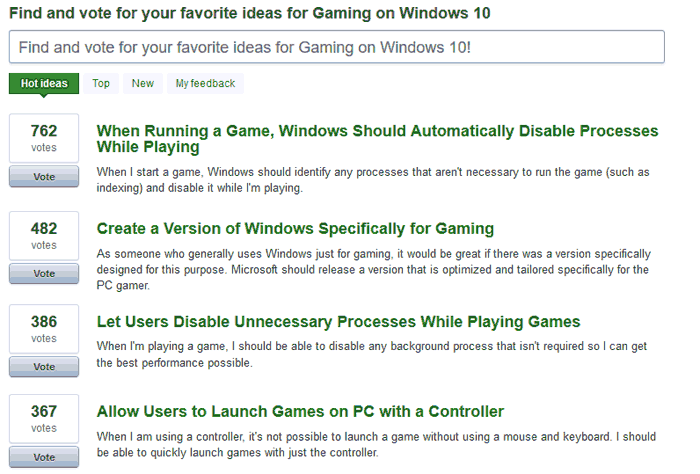 The initial request from Windows 10 gamers comes with a number of questions attached but the ideas collection phase goes beyond this scope and via the portal users can create new suggestions vote on existing suggestions and leave comments on suggestions already presented. What do you want Windows to do (or stop doing) while you’re playing a game? What can Windows do to optimize your gaming experience? What other gaming features would you like to see? I've screen-shotted the top four suggestions at the time of writing to give you can idea of how things are progressing right now, after a weekend of suggestions and input. You can see that the most popular and third most popular suggestions are about PC processing optimisation for gaming, covering similar ground, and build upon Microsoft's own Game Mode adjustments. More interesting still are suggestions that Microsoft build a Windows 10 Gaming Edition OS, and allow users to browse and launch games on their PC using a controller. The Twitter comments and suggestions look quite different from the above. Among the Tweets are requests for a better Store – or just linking up with Steam, and there are quite a few requests for Xbox emulation on PCs expanding further on the Xbox Play Anywhere idea. I'm not sure when the feedback collection phase closes but it is still open at the time of writing, and will be followed by voting in due course. One must sign up to the Xbox Ideas UserVoice service to be able to participate. microsoft should have two boot options when you firt turn on your pc , normal os or gaming os . Will it change what gets loaded into extended memory like the boot discs of old? Considering the Xbox has its own gaming version of windows 10 I don't see why they can't modify that and release it for the PC as an alternative boot option; it would be better than using the Xbox windows app. Hell you could even just scrap all that and have a boot mode that literally just boots into the xbox app, with an option to browse your storage, to add games into the library that don't appear automatically. They should release all their xbox games on pc. Also it would be nice if bloat was removed or made optional for windows.